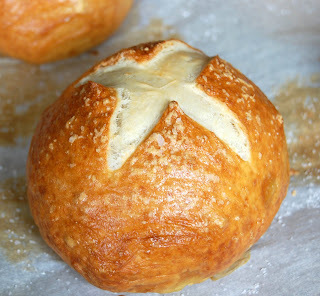 Friday Food Craft time again, and this week's installment features pretzel rolls! If you tried your hand at my homemade bagel recipe, you will find that these are actually quite similar. These are even a little bit easier as far as forming into their final shape. Also, if you like soft pretzels these will definitely get you your fix. I like to have these as burger buns, but you could just as easily eat them plain or with a dipping sauce, or make teeny tiny rolls as pretzel bites (watch the cook time If you try this, they won't need as long I am sure). Start by putting your warm water and yeast into the bowl of a stand mixer. Let stand about 5 minutes until the yeast foams up a bit (I generally add my sugar at this point as well, but you can add it with the rest of the dry ingredients if you want). If you don't have a stand mixer, place it into a mixing bowl instead. Add the flour, salt, sugar(if you haven't already added it) and butter and mix with the dough hook attachment until combined. Once most of the flour is incorporated I generally turn my mixer to a medium high speed and let it mix for about a minute to develop some gluten. This makes for a chewier pretzel roll. (Again, if you don't have a stand mixer, you can mix by hand, or use a hand mixer with a dough hook attachment). Cover with a clean towel and leave in a warm place to rise for about an hour or until the dough has doubled in size. Turn dough out onto a lightly floured surface. Separate your dough into 8 pieces and form into balls by pulling the sides to the center and pinching to seal. Place the formed rolls onto a parchment lined baking sheet, seam side down. Cover and allow to rise again for about 30 minutes. Heat oven to 425 degrees F. Fill a large saucepan with about 2 quarts of water and add 1/4 cup baking soda. Bring water to a boil and boil each roll about 1 minute, turning halfway to poach both sides. Place rolls back on baking sheet (seam side down--we want our rolls to look pretty) and brush the tops with beaten egg. Lightly salt tops of rolls and then cut a slit or "X" into the top of each one. Bake in the center rack of your oven for 15 to 20 minutes. This recipe makes about 8 dinner rolls. If you want to make burger buns, you may want to divide your dough into only 5 or 6 rolls depending on burger size (you could get about 10 sliders out of this recipe). Made these last night and they were great! I'm curious about the baking time, though, as even though I made them larger into 5 burger buns, the 20 minutes seemed a little too long. They were pretty dark by 15 minutes, so I loosely covered with foil for the rest of the time. I think I baked for a total of 18 minutes. If you make them into smaller rolls, have you found you bake them for less time? In my oven, they bake for 20 minutes. I think mine runs a little cold sometimes, though. Also, They should be very brown when they are done, that is what the baking soda in the boiling water does, making them look like classic pretzels. tried them and they turned out great, they really look pro style when you put the X on the top. thanks for the post! Glad you liked them! I find myself making these more and more, so delicious and easy. Holy Cow! I made these tonight to make sandwiches the rest of the week and they are amazing! I don't think they taste like pretzels because I've never had a pretzel that tasted so good! My husband seconded the awesomeness of this recipe. Thanks for ruining soft pretzels for me for life. But these were so easy to make that I won't mind making them all the ding dong day! BTW, 20 minutes for 8 rolls turned out perfect for me. Glad you liked them! My husband requests these every chance he gets! (Follow up to my post above.) Thanks for your answer. I've discovered that my oven seems to run hot, I think. We moved into this house less than a year before I first made these buns, so I wasn't used to the oven temp. :) Making these again this week! 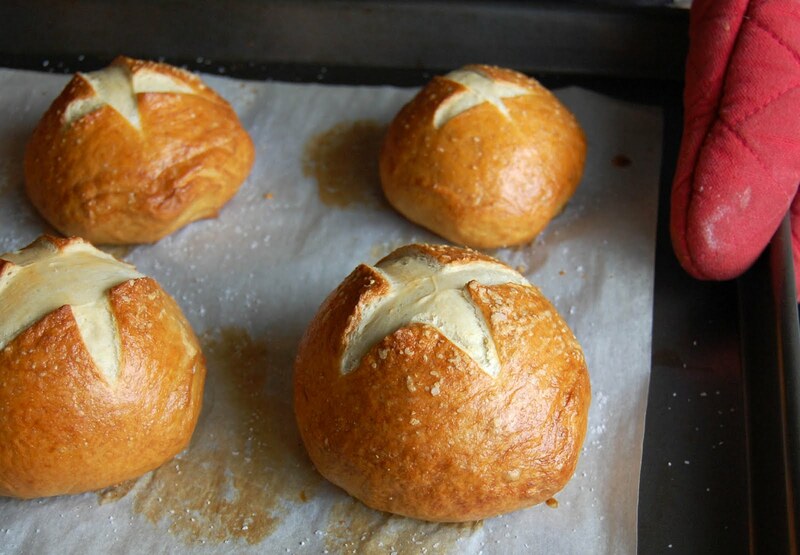 I love making pretzel rolls! These look great! Just finished making these for my husband's breakfast, delicious!! New Etsy Shop Grand Opening! More projects from vinyl: Ideas from the readers!